US Paralympian athlete may have lost his sight in childhood, but that hasn't stopped him becoming one of the world's most talented long jumpers. So, what better way to take to the world stage than a set of special 'Lex-Specs' to keep all that sand and grit out of his eyes? 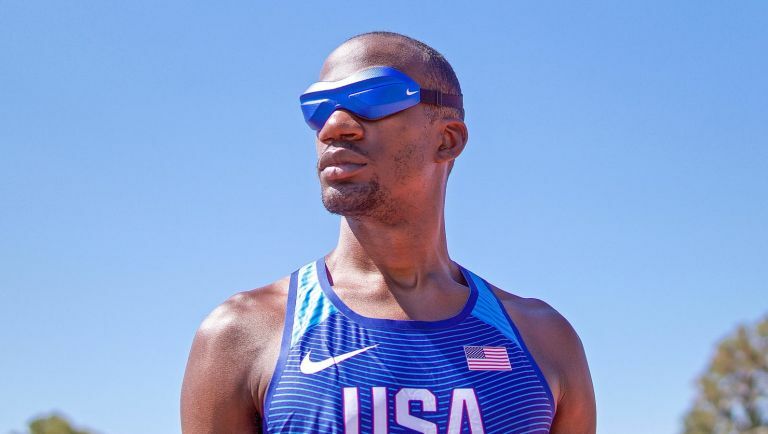 Leading up to Rio, Elexis 'Lex' Gillette worked with Nike's cross-functional NXT team at his training facility in Chula Vista, California, to refine this new incredible eyewear design. Features include a hard shell with a sculptural form that echoed the audacity of the athlete's choice crusader, and instead of painting the piece, they pulled footwear and apparel skins and played with sublimating the fabrics onto the frame. "Next came the finish," comments Nike on its official blog. "The team stayed true to Gillette's tactile desires and added additional factors: They wanted a patina that would also illuminate the eyewear's bold shape and communicate an intrepid aesthetic. So instead of painting the piece, they pulled footwear and apparel skins and played with sublimating the fabrics onto the frame." Sadly, you can't buy Gillette's amazing customer eyewear, but that doesn't mean Nike can't offer you a cool alternative - Nike's cutting-edge Nike Tailwind (£110), worn by the-one-and-only Mo Farrah. The Nike Tailwind and Tailwind Swift Sunglasses have been designed to go the distance as well as looking the part, with a lightweight, contoured design that won't slow you down and stays comfortable, mile after mile. If you want to find out more about Nike's running eyewear range, head on over to its official website now.